“Let me emphasize that while a girl is hired to work, she is also a human being, who must have her hours of rest and play. She will be all the better for having been treated with respect,” wrote Inge Lund, a female Swedish journalist, in 1916. Lund travelled to Chicago in the early 20th century to work incognito in the wealthy homes of Chicago’s elite. Her goal? To reveal the harsh working conditions experienced by Swedish American domestic servants through a series of exposés in the Chicago Daily News. 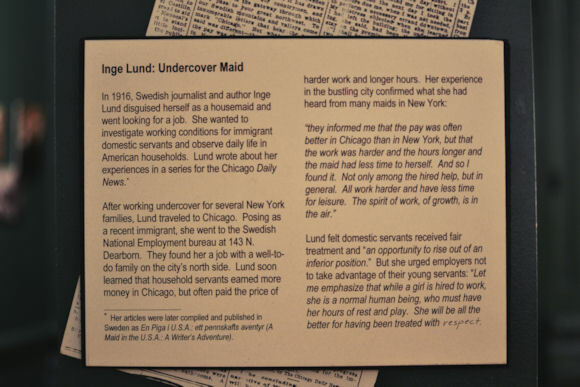 The Swedish American Museum lauds Lund as the Swedish American’s “Undercover Maid.” Lund’s story is just one among many recounted at the Swedish American Museum’s permanent exhibition “A Dream of America: Swedish Immigration to Chicago.” The exhibit follows the story of Swedish immigration to and settlement in Chicago, with special emphasis upon the late 19th and early 20th centuries. 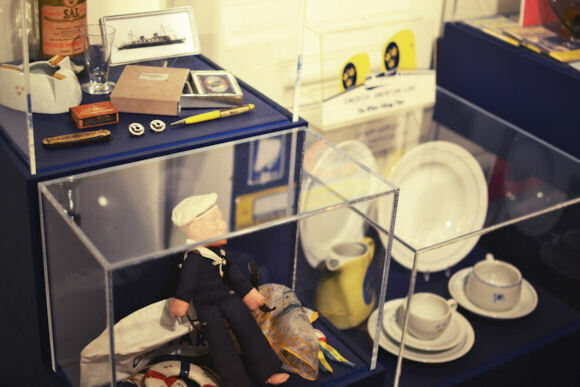 “A Dream of America” recounts the narrative of Swedish immigration to Chicago with original artifacts, many of which the Museum’s Swedish American patrons donated throughout the years. Massive trunks and worn passports illustrate the struggle of international immigration towards the promise of farmland and away from religious intolerance. Stacks of bibles (the Museum has over 700) underscore the import of religion in Swedish American life. In a parlor display, homemade linen towels and a hand-painted coffee grinder evidence the continued value placed upon traditional Scandinavian craftsmanship. To maintain an authentic aesthetic, the exhibit relies heavily upon donated artifacts to carry the narrative through thematic sections: Occupations, Meet the Press, and Swedish American Organizations are a few among others. Unfortunately, this strict dedication to authenticity prevents a fully interactive experience for visitors. Despite the fact that the exhibit is visually appealing, with hand-painted murals, a plethora of photographs, and a recreated grocery store, church, and Swedish home of the early 20th century, encased artifacts and “Do Not Touch” labels inhibit a fully hands-on experience of this otherwise engaging exhibit. Stories like the Undercover Maid’s, the true heart of the exhibition, maintain this on-going dialogue. 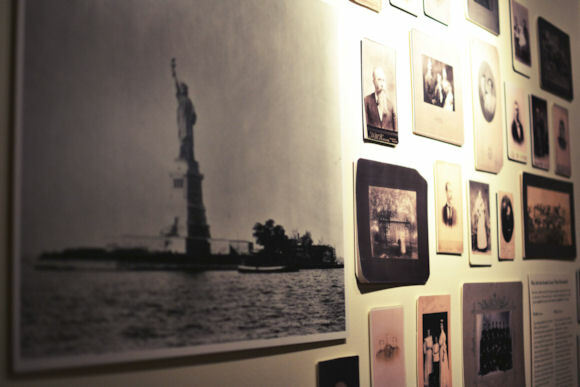 The Swedish American Museum expertly weaves the stories of individuals, from local grocer Jonas Swedburg to renowned writer Carl Sandburg, into a larger history of Swedish immigration to the city of Chicago. By putting faces and names to the Swedish immigrants and their descendants, “A Dream of America: Immigration to Chicago” breathes life into a stale narrative; it illustrates the diversity of the Swedish American experience in Chicago. In addition, these familiar faces afford the most personal means of connection between the past and present. 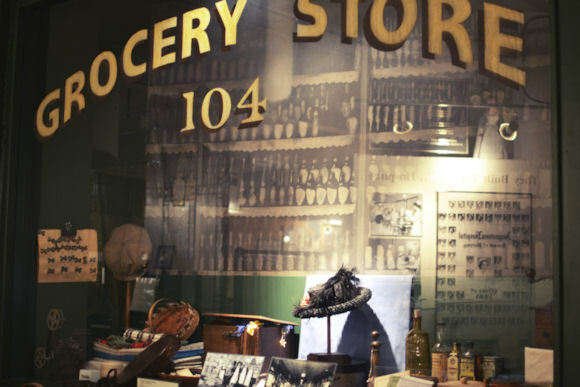 Visitors might ask, “Who was the grocer in my community? The activist? The artist?” It allows each visitor to draw similarities between his or her history and that of the Swedes. The audience connects, discusses, and collectively recalls memories of their own. 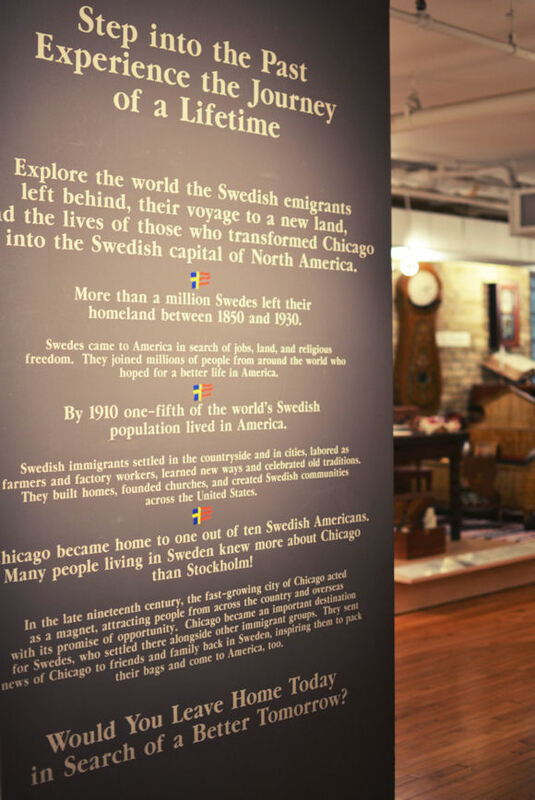 Therefore, the Swedish American Museum’s “A Dream of America: Swedish Immigration to Chicago” serves more than just the ethnic population on which it focuses; it embodies a particularly rewarding destination for family and friends to collectively share and discuss their own ethnic, familial and community heritage.